In this volume, author Richard Goldhurst has crafted a whole life biography that presents Pershing's professional development for and through the service for which he is most remembered. Now over forty years old, this tome presents its subject without the searchlights of 21st-century standards. As such it is, perhaps, a truer report and certainly one to be included in a balanced study of this classic American soldier. The Great War was the crowded hour of many lives but its leaders were not born in Sam Browne belts on the Western Front. Many came from small towns or farms, trained by the Army and in the field and were ready when the call came. Pipe Clay and Drill is the story of the famous classic American soldier, John J. Pershing. 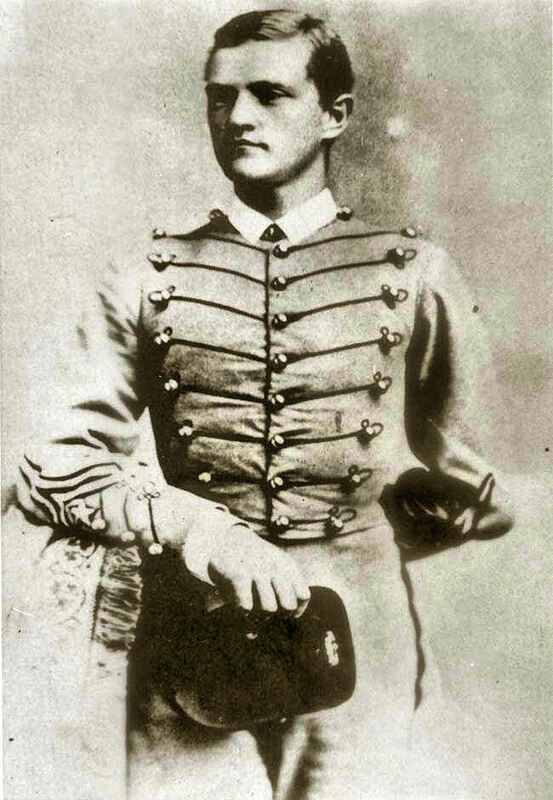 Pershing was typical of many army officers of his era. 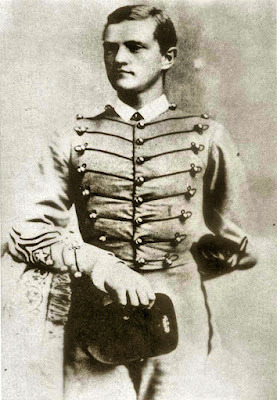 Born (in 1860) and raised in Laclede, Missouri, his early life was shaped by memories of the Civil War, his education provided at West Point and his first combat foes were Indians across the West. Like many who ended up as generals, he was attracted to the Point by the promise of a free education. Tours as military instructor at the University of Nebraska, an assistant instructor in tactics at West Point and a temptation to leave the Army for the law prepared him for combat command. When war was declared against Spain in 1898 Pershing used his contacts to evade a freeze on officers with West Point appointments to be returned to the Tenth Cavalry (Buffalo Soldiers), whom he led in combat alongside Theodore Roosevelt and his Rough Riders in Cuba. After success there he was reassigned to the Philippines, where he held a series of military and governing positions through which he enhanced his standing both within the Army and with the American public. By 1916 Pershing was prepared for his rendezvous with destiny, and Europe was in the throes of murderous warfare and competing forces had driven Mexico into a boiling caldron. Pershing was dispatched to El Paso to organize the defense of America's southern border. While there his life was shattered by a fire in the family home at the Presidio in San Francisco that killed his wife and three daughters, with only his son, Warren, surviving. 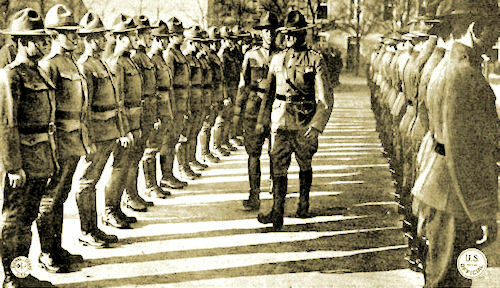 The event that set the course of Pershing's future career occurred on 9 March 1916 as 500 troops of Pancho Villa raided Columbus, New Mexico. Tapped to lead the Punitive Expedition, Pershing gained a reputation as one who, though Villa remained elusive, could command a large (10,000) army into territory that was hostile, both physically and politically. His experience with new technology, including aircraft, and challenges of supply equipped him for leadership of the largest American Expeditionary Force to that time. The task of selecting his force familiarized him with the capabilities and limitations of the Army. Withdrawal from Mexico found Pershing eager for his next challenge. Taking reporters into his confidence the day after his return to the United States, he told them "We have broken diplomatic relations with Germany. That means we will send an expedition abroad. I'd like to command it. Each of you must know some way in which you can help me. Now tell me how I can help you so that you can help me." That assignment was not inevitable. Though outranked by generals deemed too old and Leonard Wood who was too political, the stars fell on Pershing. His task was a daunting one. Provided with an army swollen with millions of volunteers and draftees Pershing was determined to withhold them from the front until they were sufficiently trained to be an army worthy of their country. His persistence, and orders from President Wilson that the American forces would fight only as an independent army, created intense clashes with Allied officers and politicians who demanded infantry to fill the holes in the ranks of their own decimated legions. Some of Pershing's greatest fights were with Allied brass, not German hordes. Table-pounding confrontations amid threats of defeat and disgrace were redeemed by occasional release of trained Doughboys to stem the tide of Hun victories when the Allied lines seemed about to break. French prime minister Clemenceau repeatedly tried to get Pershing sent home to be replaced by a more compliant commander. However, in the final offensive the AEF won America's place at the Peace Conference. The magnitude of the Great War ensured that it would spawn the leaders and institutions of the future. Pershing was instrumental in advancing the careers of Fox Connor, George Marshall, and George Patton, just to name a few. Perhaps Pershing's most significant contribution was the establishment of the General Purchasing Board under the command of Lt. Col. Charles Dawes, his friend from Nebraska days and future vice-president and Nobel Peace Prize winner. The board brought management skills to turn the procurement process into a government-producer enterprise, arguably the origins of the military-industrial complex about which we would hear so much later. We should take full advantage of the situation and continue the offensive until we compel Germany's unconditional surrender…The surrender of the German Armies would have been an advantage to the allies in the enforcement of peace terms and would have been a greater deterrent against possible future aggression. The victorious general returned to serve as chief of staff of the Army and enjoy a distinguished retirement, although the ultimate prize awarded to other conquerors was not to be his. He made some efforts to win the Republican nomination for president in 1920 but had little support and, when the party turned to a dark horse, it was Warren Harding, not John J. Pershing.